This Mr. Millet. Is he dead? Is he dead? You see a painter has so much more talent when he's dead. Indeed the deader he is, the better he is. Just look at this Rembrandt fellow. He must have been good in his day. Since he died? He's incomparable! Worth millions! —Thorpe, an art collector whose theory about art investment triggers the scheme that will save Mark Twain's fictional version the painter Jean-Francois Millet from poverty and obscurity. Trying to rescue a never produced playscript from the literary dustbin, no matter how prestigious the name attached to it, is a risky business. Maybe there was justification for it never having been produced. Maybe it's just too late to rescue it from obscurity. But Shelley Fisher Fishkin, who, true to her name, fished Mark Twain's 1898 farce Is He Dead? out of the Mark Twain papers at UC-Berkley's Bancroft Library, was convinced that this stillborn play was true to its author's many famously quoted observations: "Humor is the great thing, the saving thing. The minute it crops up, all our irritations and resentments slip away and a sunny spirit takes their place." But publishing her own critical edition of the play, wasn't going to bring it from page to stage. It took a fortuitous introduction to producer Bob Boyet and another five years to pull off that hat trick. Now, buoyed with fifteen producers aboard (with Boyet at the top of the list and Fishkin at the bottom), Is He Dead? is very much alive at the Lyceum Theater. To get right to the good news: It will indeed make "all your irritations and resentments slip away" the minute the curtain rises. This delectable confection is hardly going topple Tom Sawyer or Huckleberry Finn from the top tier of Twain's oeuvre, but it's great fun. Not to belittle Twain's satiric wit, the success of this more than a century delayed Broadway debut would not be possible without the money and talent lavished on it. To begin, there's Michael Blakemore's masterly direction and a cast of farceurs who brilliantly, and with pitch-perfect timing, squeeze every drop of humor from this madcap hoax about Jean Francois Millet, one of the 19th Century's greatest artists who was especially noted for his paintings of peasant farmers. With David Ives — the man who's reinvigorated so many of the vintage musicals for the Encores! concerts — credited as adapter, it's hard to pinpoint where Twain ends and Ives' diddling comes into play. This is underscored by the question mark that straddles the main title and the subtitle, A New Comedy. Given that much of the dialogue smacks of Ives' flair for smart repartee, Twain's long dead script's newness does indeed owe a large debt to Ives's cutting, restructuring and rewriting. The plot, or rather all you need to or should know revolves around the prolific but poor Millet ( Norbert Leo Butz). Gorgeous canvases, including his famous "The Gleaners," line Millet's studio outside Paris (bravo Peter J. Davison for creating the magnificent atelier and second act salon. . . and Peter Kaczorowski for his airy lighting!). However, even at bargain basement prices, the paintings don't sell. While Millet's kindly landladies (Mary Louise Burke and Patricia Connolly) are willing to accept them in lieu of the monthly rent, the play's chief villain, Bastien André (Byron Jennings), an unscrupulous picture dealer and money-lender, wants the debt Millet has run up paid back in francs. Basil Thorpe (David Pittu), a more appreciative but no less crass art collector, declares that much as he loves Millet's pictures he never buys works by living artists since paintings by dead artists are more valuable ("The deader he is, the better he is. "), Thorpe's philosophy inspires Millet's loyal friends and students (Michael McGrath, Tom Alan Robbins and Jeremy Bobb) to cook up the hoax that will make their friend rich and famous —and that turns the practice of undervaluing contemporary art into a delicious door slamming farce. You're hardly going to be surprised about what this scheme entails and its effect on Millet's fortune and Butz's role. Suffice it to say, that Brandon Thomas's cigar smoking Charley's Aunt of stage and screen fame has nothing on the Widow Tillou of Is He Dead? and that Blakemore allows no chance for physical and mistaken identity shtick to go unrealized. The leading role is made to order for Butz, who is winning no matter which of Martin Pakledinaz's outfits he's wearing. (And a standing ovation to Pakledinaz for the entire cast's sensational costumes!). The Widow Tillou transports his impoverished painter to bravura territory. While Butz is the star without whose character there would be no comedy, old or new, this is an all-star show which is why even the corniest routines work. The three actors playing Millet's buddies and boosters ably differentiate their characters. The always superb Byron Jennings tops himself as the lecherous Bastien André. The versatile David Pittu tickles the funny bone whether as the art dealer who triggers the hoax, a newspaper reporter, a butler or, funniest of all, the King of France. Another veteran crowd pleaser, John McMartin, is engagingly droll as the widower Leroux who competes with the villainous André for the hand of the buxom charms of the Widow Tillou. 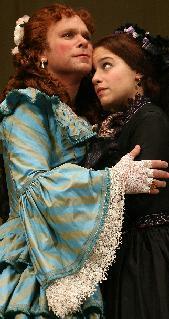 Jenn Gambatese and Bridget Regan give lively performances as Papa Leroux's s daughters Marie and Cecile. Though the two landladies have fairly minor roles, as played by Mary Louise Burke and Patricial Connolly, they make a major contribution to the procedings. The play is studded with scenes that give these stellar performers opportunities galore to shine. If I had to pick the one scene that's most likely to have you in stitches it would be Monsieur Thorpe's frenzied bidding for everything in sight that Millet might have touched. But then there's the scene in which the horrified villain is witness to the Widow Tillou's not so splendid secrets heretofore covered by her corkscrew curled wig (by hair and wig wizard Paul Huntley) and ruffled hoopskirts. Two women sitting in back of me at Thursday night's press preview laughed loudly for most of the two hours. When the titular hoax came to its predictable happy end, one of the women declared. "Wonderful, but the critics will hate this." Judging from everything I've said, what she enjoyed was certainly not wasted on this critic. And in case you're wondering what Mark Twain would think about this adaptation. I think he would be delighted to see it performed at long last. As for cuts and rewrites. . . even if he had a few nitpicks, no matter. After all he IS dead.